Initially I wanted to use rubrics to collect data on what 21st Century skills looked like in kindergarten. 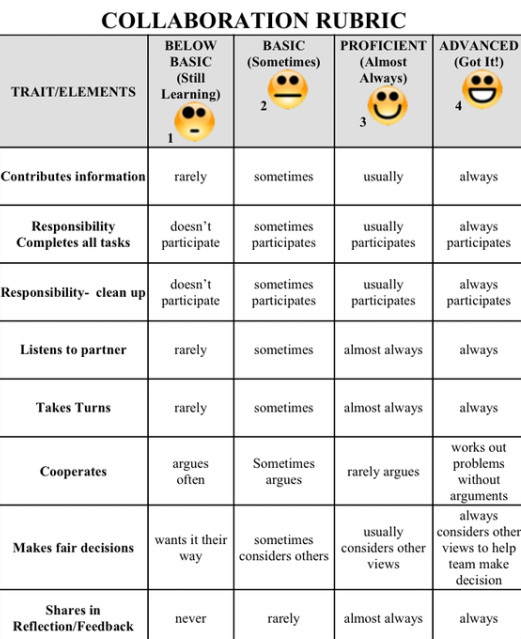 I began using rubrics from Buck Institute for Education and Howell Mountain Elementary School. 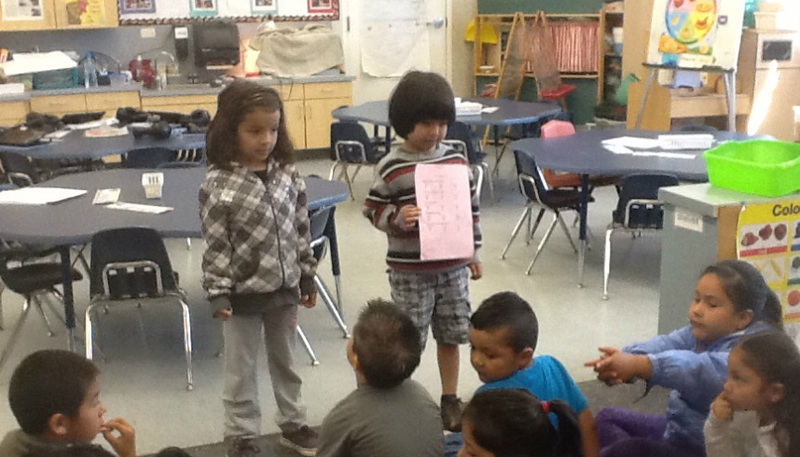 In order to leverage a direct dialog between students, I decided to introduce rubrics during our K-6 iTeam Projects. I quickly discovered that the rubrics needed to be adapted to each project. I was amazed to discover the power behind using rubrics. When students helped me create rubrics, they were very invested in their purpose and had a greater understanding of our project. In addition, the rubrics gave students a clear understanding of our learning goals and a reference point for observing their own progress toward mastery. An unexpected benefit to using rubrics was less time off task and greater ownership of a students' behavior. 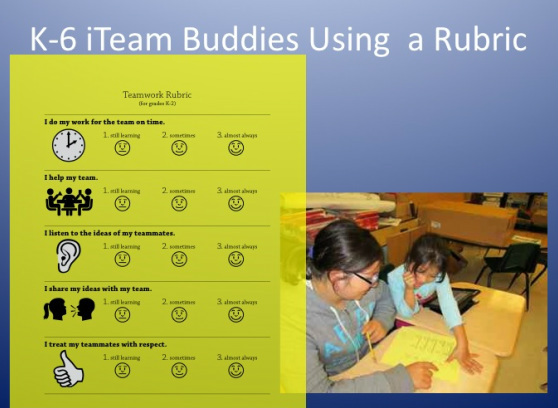 Rubrics help establish a class culture where students understand their own learning process and they learn how to support their fellow classmates in their individual goals. Students help develop rubrics for content material as well as 21st century learning skills. Project learning goals and Common Core Standards can also be assessed with Rubrics by assessing progress towards mastery. You can find rubrics for all grades at Buck Institute for Education, FreeBies. Good teaching of a curriculum for the 21st century requires a dynamic cycle of guided inquiry, assessment and reflection. When assessments are built into the projects and rubrics are customized to specific learning goals related to the projects, the learning is the most powerful. Buck Institute for Education, FreeBIEs. Common core standards were developed in response to a realization that, in an ever-changing world, our students need better knowledge and tools to prepare them to succeed in the global economy. The common core standards identify grade level content knowledge, technology goals, and 21st century skills required to prepare students to compete in college and the workplace. The International Society for Technology in Education (ISTE) has created standards for teaching with technology that focus on 21st Century skill development with technology. UDL guidelines ensure that the curriculum and the learning environment are designed for all students. Technology is providing teachers with many tools to support all learners with multiple modalities for learning. Click here more information on UDL. 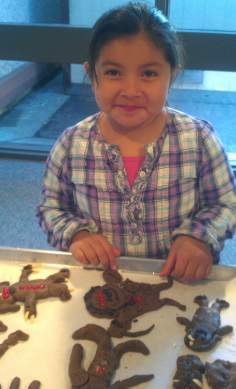 Fortunately, we are not all cut from the same cookie cutter!